I’m so excited to bring you a great giveaway today from Calphalon. They’re a brand that’s new to my kitchen, and I am happy to say that I really love them. I’ve used another high-end brand (for my stainless steel pieces) in my kitchen for years. You know the one that’s all over the Food Network. It preforms beautifully, but when my younger sister-in-law recently asked me which brand of cookware she should invest in, I was hesitant to recommend the brand I use solely because of the price. I knew they’re must be a comparable line on the market with a better price tag. Recently I was able to try Calphalon AccuCore stainless cookware. I tried out the piece in the pictures, a 3 quart saute pan. It browns as good as my other skillet, and actually fells better in my hand. The handle feels more stable. The only downside I see is that the sides of the skillet, towards the top may be a little thinner. But on the other hand, these pots and pans come with an attractive clear lid. So there are upsides and downsides to each line. To really test this skillet out, I tried the most difficult browning that I do. That’s over high heat, with sliced meats, in a purposefully overcrowded pan. I first drizzled a very hot pan with rice oil (it has a high smoke point). Then I added pork slices that had been sprinkled with kosher salt. Now if you have never cooked with stainless, this is what’s going to happen. The meat will be completely stuck to the pan at first, but then as it browns, it releases, and that’s when you flip it, or in this case toss it around. I then continued to cook the meat over high heat, letting the other side brown. I made sure there was a good dark brown film all over the bottom before I went to turn down the heat. This is where all the good flavor in the sauce will come from. I was happy to see that my pork browned nicely, and didn’t burn. 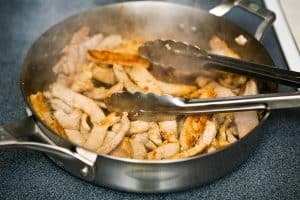 Less expensive skillets that I have owned in the past cannot brown foods without burning them. Next I add the vegetables and some chicken stock or dry white wine. I continue to cook this, while scrapping from the bottom of the pan, until the vegetables are tender crisp. As you can see, the liquid that I deglazed the pan with turned the same dark brown color that the bottom of the pan was. Now that’s some flavor packed goodness. Next I add some sweet chili Thai dipping sauce and simmer until the sauce has thickened. Then to finish the stir-fry I add some Thai basil and remove from the heat. I was overly impressed with this skillet. Cleanup was a breeze too. Because I had deglazed the pan, all I had to do was just gently clean it with my dish brush. I served the stir-fry with some sushi rice and garnished with sliced green onions. 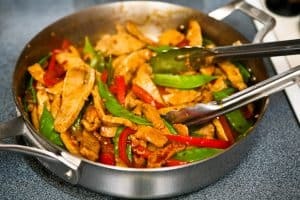 The sweet chili sauce, usually only used as a dip, makes a wonderfully flavorful stir fry that’s not to sweet or spicy. My whole family loved it, even my young son. Preheat skillet over high heat. 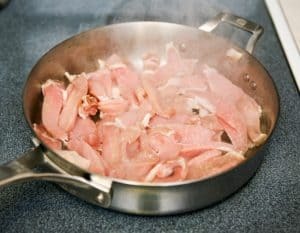 Add salt to pork and toss to combine. Drizzle skillet with oil and add pork. Cook over high heat until one side is browned. Turn over pork and cook on the other side. When pork is done, and browned, add chicken stock or wine to deglaze pan. Add snow peas, onion and bell pepper. Cook over medium heat, scraping the bottom of the pan until all the brown bits are up. Add sweet chili sauce and stir to combine. Cook until sauce has thickened slightly. Remove from heat and add Thai basil. Serve with rice garnished with green onions. For a chance to win a $500 Calphalon Gift card, just leave a comment below telling me your favorite stir fry. For even more chances to win, visit my Food Blogger Friends below who are running the same giveaway! This blog post is part of a paid SocialMoms and Calphalon blogging program. The opinions and ideas expressed here are my own. My favorite stir fry is a veg stir fry with all the bits and pieces from the fridge! What a great giveaway. Thanks for offering the chance to win. This stir fry looks delicious. Just pinned this to my foodie board and posted a reminder to add this to my party menu for New Years! Yay! The only stir fry type dish I have tried so far is chicken fried rice so I am looking forward to trying this one. Honestly, I’m not certain. I’ve made a pork stir fry that I enjoyed…but I definitely want to try this one! 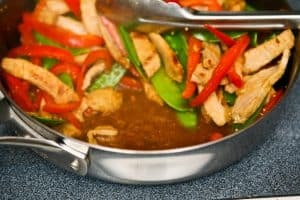 My favorite stir fry is actually a spicy thai basil I had at a restaurant where I used to live so I was thrilled when I saw this recipe! Definitely going to make asap. Crossing my fingers! I could really use more cookware, but of course who couldn’t! Happy Thanksgiving! I love stirfried eggplant with basil. I’ll definitely be adapting this recipe to see what I can come up with. MY favorite stir fry is anything spicy. I really don’t care what meat is in it or what vegetables (except broccoli) just make it spicy! I would love to win this. New website sounds neat. I love stir-frys! The snap peas in this are perfect! 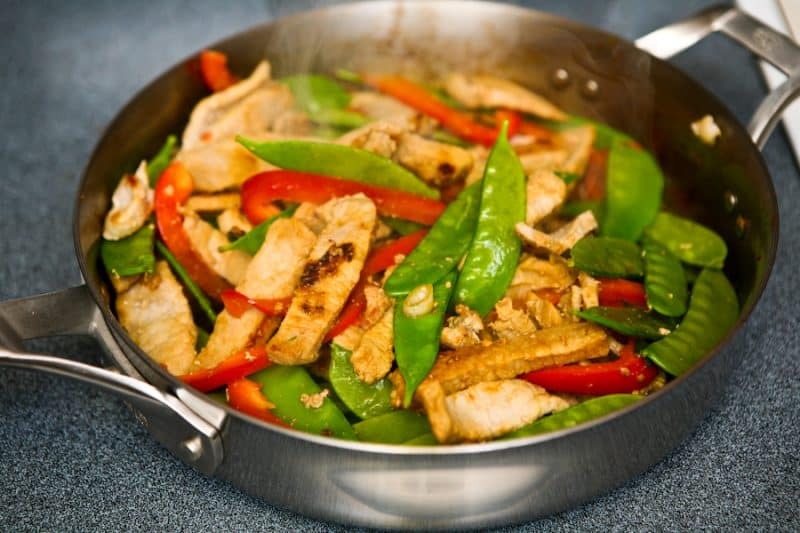 Your stir fry looks amazing!! My favorite is nothing fancy- chicken and vegetables are a classic for me! The only stir fry I tried was a frozen bag set. Thanks this is what is for dinner tonight! Looks Yummy! I usually just use seasoned salt for my easy stir fry, this looks delicious though! 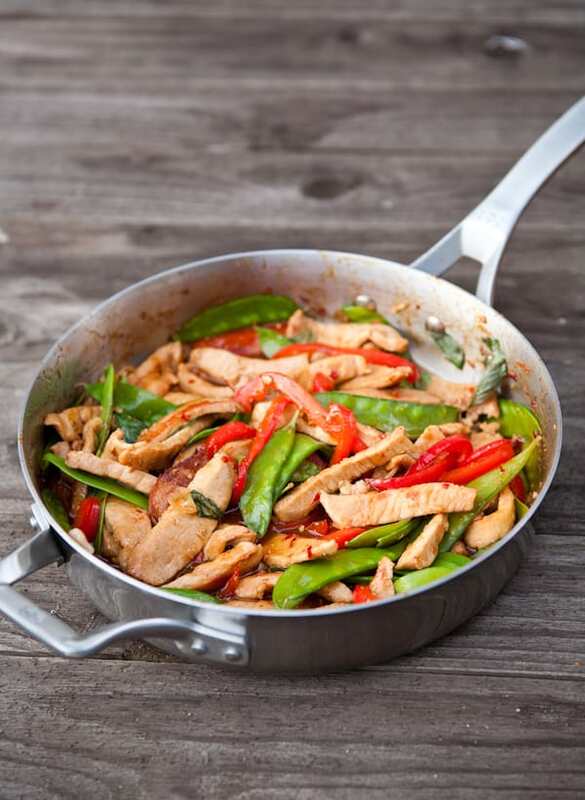 My favorite stir fry is one that uses chicken, green beans, and lots of green onion! I love the simplicity but deliciousness of this recipe! I love a good stir fry, my husband makes fabulous ones! And what a great giveaway! I’ve never been a big fan of pork but that dish looks scrumptious. My favorite stir fry would be spicy chicken and broccoli! Your stir fry looks delish will be making that! I love every kind of stir fry! This looks awesome. Thank you for this great giveaway! I could really use some new pans! 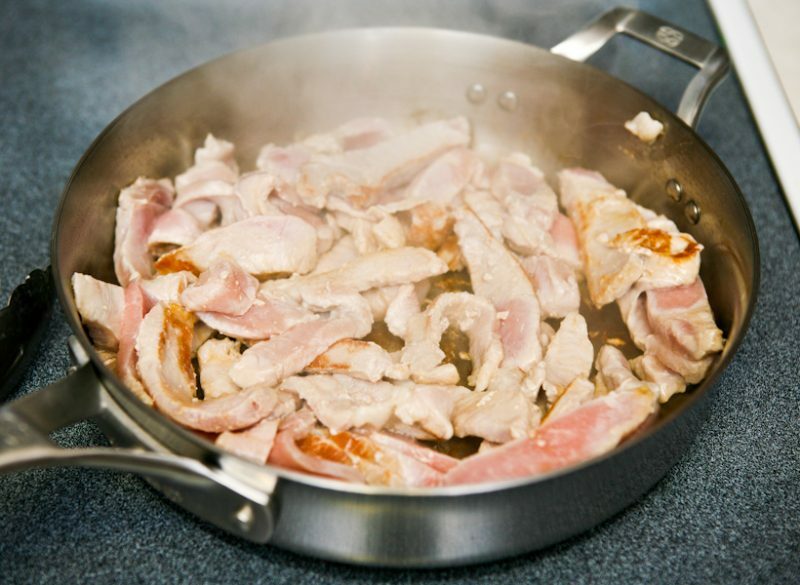 This looks great… your pork did brown very nicely in the pan! I can’t wait to learn from your site as I just found it. How pretty! I like all kinds of stir-fry. Can’t wait wait to try!!! It looks yummy!! I love orange chicken stir fry! So yummy! My favorite stir fry is broccoli & beef! I really love stir fry, it is the optimal easy weeknight meal. Super awesome giveaway! I love lo mein. I like to use spring onions and diced carrots in mine. It is the simplest stir fry. I love stir fry although I tend to just do chicken with onions and peppers and basic seasoning usually…I should really change it up. I like shrimp & broccoli in a stir fry. I like shrimp with veggie. YUM! Beef & shrimp stir fry w/ onions,peppers,broccoli,mushrooms over linguine noodles. Chicken Cacciatore Recipe is the only thing I can recall. I started cooking when I was very little and loved it ever since. I love beef and broccoli stir fry! I love chicken snap peas & brocolli stir fry! Yum & Healthy! Steak and ginger stir fry for me. Chicken and broccoli, with spicy stir fry sauce. I love chicken and peppers in my stir fry with sweet chili sauce! My favorite stir fry is chicken and veggies over noodles. Veggies and tofu stir fry with miso seasoning! My favorite stir fry is cashew chicken. I love Shrimp and Bell pepper (Red + Green + Yellow + Orange) stir-fry! Truthfully, I love any type. Whatever’s ripened in the garden on that particular day or is on the clearance rack at the grocery store. Usually the meat consists of a lean cut and I usually pile it over a bed of rice or quinoa or a mixture of both. Sometimes we’ll even pile it into a wrap with some spinach or kale. That’s what’s great about stir-fry, you could eat it every day of the week and still not have the same thing twice! I like the beef and broccoli stir fry. My favorite stir fry is chicken and broccoli with a simple soy-ginger sauce. I love lemongrass chicken stir fry. I love peanut sauce stir fry! I love chicken teriyaki stir fry, with lots of red peppers, peas, and garlic. 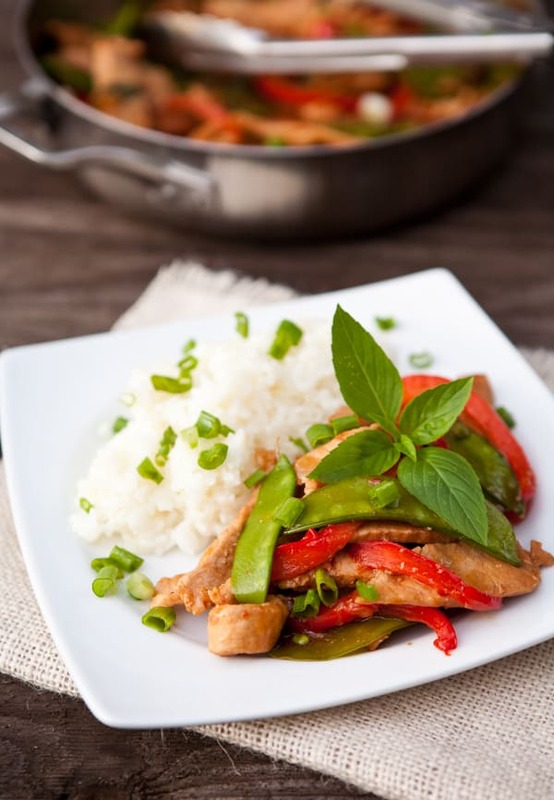 Your Thai Basil Pork stir fry looks great too! My favorite is veggies and chicken, with pepper and garlic. Seared tofu and veggies. Cheers! My favorite is chicken fried rice! Love the taste! i like egg chow mein stir fry! I like Mango Chicken Stir Fry. Plus, I really like Jasmine rice with it. The sweet and salty go great together. Especially if they add cashews. I love anything with Peanut Sauce….chicken, broccoli and brown rice are best. My favorite is broccoli and chicken stir fry! My favorite stir fry is beef, with broccoli, baby corn, water chestnuts, peppers and anything I find in the fridge! I like broccoli and chicken stir fry. I like spicy chicken stir fry. 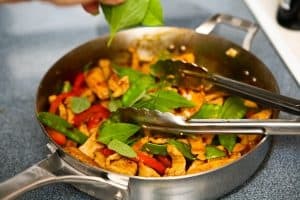 I just purchased my first Thai basil and am thrilled to see this recipe. I love to make stir fried pepper steak. My favorite stir fry is something with chicken and broccoli. My favorite is a Beef and Broccoli stir fry with oyster sauce. I love beef stir fry! My favorite stir fry is a ramen noodle stir fry. I cook the noodles and then use soy sauce, the spice packet, onions, garlic and tomatoes to make a base for the stir fry. I use any of the veggies I happen to have in the fridge or freezer although I think cabbage, green peppers and carrots work best. Loving this giveaway and that dish looks amazing!!!!! Stir fry is good, cooking it in Calphalon would be great. Oops didn’t get my favorite on post, just a basic veggie stir fry with some tofu. My favorite is just beef and broccoli, can’t go wrong with that. a good beef stir fry. I like to make a chicken stir-fry with teriyaki sauce and random veggies. Anything veggie with tofu! Especially if it helps clean out the fridge! Thinly sliced beef with lots of ginger, red peppers & whatever else is on hand. I love any stir fry with pork and basil. Beef or chicken thai-style stir fry with broccoli, peppers, mushrooms and cilantro! I will try the basil in place of the cilantro though, that sounds great. My favorite stir fry would have to be beef and broccoli! Just love it! I love broccoli and chicken stirfry with brown rice. i love all types of stir frys but I especially love adding broccoli, garlic, and coconut milk to a stir fry and serving it over jasmine rice! One of my fav stir-fries is a chicken curry. ty and good luck everyone! My favorite stirfry is when we have leftover Teriyaki Steak. Slice it up real thin and add any veggie that is yummy in a stirfry, with even more teriyaki sauce! mmm! My favorite stir fries are Thai ones with spicy Thai chilis and shrimp and Thai basil! My favorite stir fry is Beef and Broccoli!! I love Beef with broccoli – but really, I like just about any stir fry which uses leftover meat and vegetables! I love broccoli and snap pea stir fry! 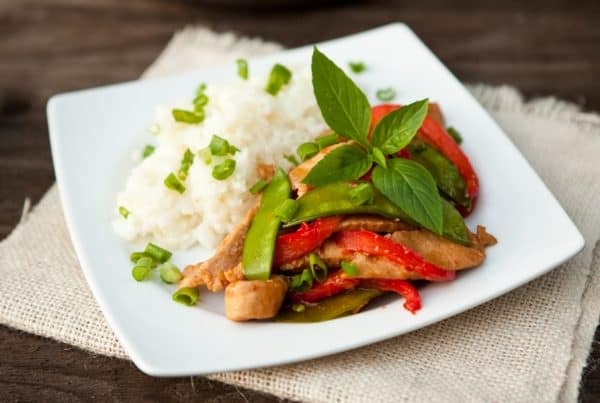 i love chicken, rice and lots of veggies in a stir fry, it’s my favorite! My favorite stir-fry is broccoli, chicken, and water chestnuts with a teriyaki sauce! Yum! I love a good chicken stir-fry! Stir fry shrimp & glass noodles.